By Lissa Mann In June of this year, I helped a friend move his many saltwater fish tanks. It took over twenty hours to move both his stuff and his fish from Manhattan to his new house in New Jersey. That was the moving experience I was reflecting upon when I made the necessary preparations to move my own tank. There were a couple of things working in my favor: first, I was only moving a few blocks away, so there would be no long travel times; second, I only had one 75g tank, instead of multiple tanks of 50 gallons or larger. I gathered as many buckets, coolers, heaters and airstones as I could find. In the end, I had more containers to hold livestock than livestock to go into the containers. When we moved my friend, we had to remove all of the sand from all of his tanks which took a lot of time and a lot of heavy lifting. Instead of doing that, I decided to enlist three friends to help me heft the tank out of my apartment with the sand bed intact. I felt like that would have the added bonus of keeping at least some of my bacterial population intact. I actually felt pretty optimistic about this move, since I had moved my 40 gallon tank before without losing any of the fish or corals and I’d left the sand bed intact then as well. The last full tank shot of my 75 gallon tank. The brown that is apparent over the rocks and sand bed are red planaria flatworms. I had two other “fish people” (as my non-fish friends call me) helping me with the move. We designated one large cooler for the fish, and I put in several large pieces of live rock, a heater, a small powerhead and an airstone. This way, the water would be sure to be oxygenated and there would be the beneficial bacteria on the liverock to help filter the water while the fish were in there. There was another larger container with the rest of the coral encrusted rocks and we put a powerhead in that as well. All of the smaller pieces of coral were individually bagged and put in another cooler to stay warm. The rocks were all placed in four buckets and completely covered with water to preserve the bacteria. We drained the water out of the tank into four five gallon jugs that I had, and we made a new 20 gallon batch of saltwater at the new place earlier in the evening. We did all of this to reduce the possibility of the tank cycling after the move. The only seeming blip was the was had to cut apart my plumbing, so I wouldn’t be able to have the sump and skimmer online, but we didn’t think that was such a big deal. I had two phosban reactors with carbon to run on the tank and plenty of powerheads for circulation. I could get new bulkheads and re-plumb the tank the following day. So, we moved the tank with the sand, which involved a lot of grunting and some very sore hands. Once the tank was at the new place, I put the rocks back in, I put the corals back in, and I put the fish back in. We kicked up a little sand, but everything looked okay. There were even some polyps out on some of the corals from the ambient light in the room. My two sand sleeping wrasses dove directly into the sand, but the other fish were swimming around checking out their “new” home and the clownfish were hosting their mushrooms. I went to bed feeling okay (and my friend made it to bed before 8:00am the next morning). 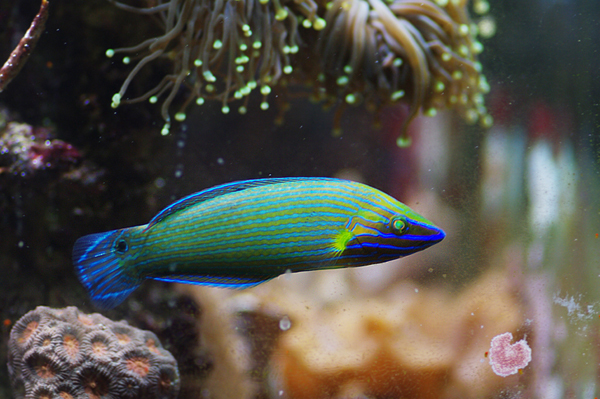 H. richmondi, one of the sand burrowing wrasses in my tank. There is a baby’s breath favia in the background. The next morning, things were not looking so good. I only saw one clownfish and my cleaner shrimp swimming around and my rabbit fish was dead at the front of the tank. The whole apartment smelled like dying flatworms. I had been fighting a losing battle with the red planaria flatworms for almost a year. Before moving the tank, I sucked as many as I could out of the tank and did multiple water changes per week. I didn’t really think much about it after that since they are mostly a nuisance. When I switched my tank from a 40 gallon to a 75 galllon, I did a massive treatment of Flatworm Exit that killed most of my SPS (the toxins that the red planaria released, not the FWE itself) and in the end, didn’t end up ridding my tank of flatworms. I had been very nervous about doing another treatment following that disaster. Obviously the smell of the toxic flatworms concerned me. I did two 20 gallon water changes throughout the day. By the end of the day, both of my clowns were out, the cleaner shrimp was out, my clams were alive and two of my three wrasses had come out. Again, I went to bed feeling okay and like I was out of the woods. 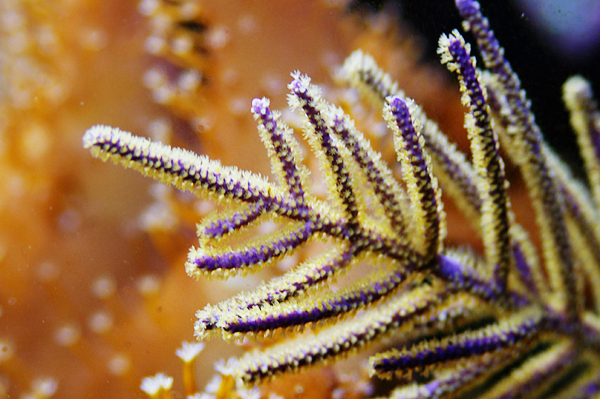 This purple Murecia gorgonian was one of the survivors of this move. It still looks good and there has been no tissue loss. As a group, the octocorals weathered the move well. The next morning, I woke up and everything was dead. The flatworm smell was worse and the clownfish were dead in the front of the tank. There was a pile of dead bristleworms in one corner of the tank. The corals looked awful. I called on another friend with a saltwater tank to do emergency salvage work on the corals. I moved all of the corals that looked like they still had some tissue left into his tank. Everything else was dead, so we emptied the tank and bleached it and all of the rock. No more flatworms. So that’s where things stand. It looks like about one third of my coral is going to survive. All of my SPS is dead with the exception of a dime sized patch of porites on my Christmas tree worm rock. Three of the Christmas tree worms and one hermit crab survived. The LPS that is left is touch and go. I lost all of my really expensive pieces (of course), but my bubble coral seems to be okay as well as parts of a huge favia that was a showpiece in my tank. Most of my gorgonians and softies seem to be doing okay, though my large colony of green nepthea is a little worse for wear. 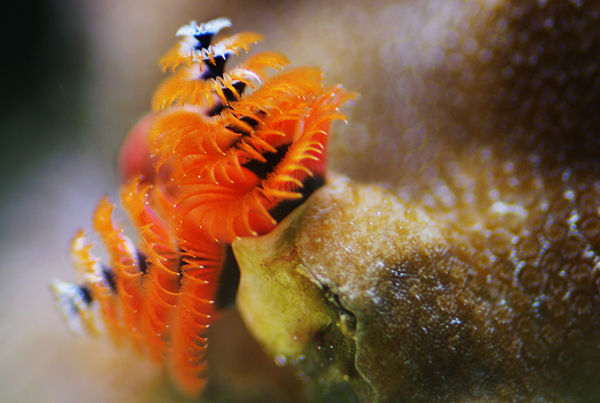 Christmas tree worms with porites. 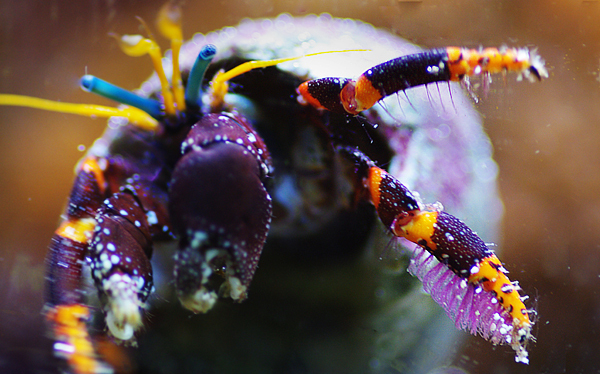 Orange banded Hawaiian hermit crab. These are the only two non-coral invertebrates to survive. I am trying to think positively about this experience. While I have lost all of my livestock, it is a little freeing as I have the opportunity to set up a new tank exactly how I want it and without the problems that were plaguing me in my old system. And you can also bet I will flatworm exit every single frag I ever receive from now until I stop keeping saltwater fish. I would like to close with a moving checklist. While it is impossible to prepare for every eventuality, it is possible to be prepared. In my case, the only thing I could have done differently was to replace the sand bed. I think the flatworms that were living in the sandbed died when the water was drained out of the tank, and toxins slowly leached out of the sand bed over the course of the two days. Even if I had continued changing twenty gallons of water every four hours or so, I am not sure I would have been able to save my tank. The best thing you can do is be prepared for anything. Before You Move: – Do several water changes. – Make extra water for the tank. – Assemble spare PVC parts in the event you need to replumb your tank. – Gather buckets for holding livestock. – Gather airstones and small powerheads – Purchase bags for corals. – Set aside a large pump and tubing for pumping water in and out. During The Move: – Put liverock in all of the buckets with fish. – Put airstones in all of the buckets with fish. – Put powerheads in all of the buckets with coral. – Move quickly, but carefully. After The Move: – If possible, set up your skimmer. – Put new GFO and Phosban on the tank – Put a filter sock on the drain to filter any gunk you kick up. – Take a deep breath and try to sleep.